ZIP is an archive file format that supports lossless data compression. A ZIP file may contain one or more files or directories that may have been compressed. The ZIP file format permits a number of compression algorithms, though DEFLATE is the most common. This format was originally created in 1989 and released to the public domain on February 14, 1989 by Phil Katz, and was first implemented in PKWARE, Inc.'s PKZIP utility, as a replacement for the previous ARC compression format by Thom Henderson. The ZIP format was then quickly supported by many software utilities other than PKZIP. Microsoft has included built-in ZIP support (under the name "compressed folders") in versions of Microsoft Windows since 1998. Apple has included built-in ZIP support in Mac OS X 10.3 (via BOMArchiveHelper, now Archive Utility) and later. Most free operating systems have built in support for ZIP in similar manners to Windows and Mac OS X.
ZIP files generally use the file extensions .zip or .ZIP and the MIME media type application/zip. ZIP is used as a base file format by many programs, usually under a different name. When navigating a file system via a user interface, graphical icons representing ZIP files often appear as a document or other object prominently featuring a zipper. The .ZIP file format was created by Phil Katz of PKWARE. He created the format after PKWARE had a lawsuit filed against them by Systems Enhancement Associates (SEA) claiming that his archiving products, named PKARC, were derivatives of SEA's ARC archiving system. The name "zip" (meaning "move at high speed") was suggested by Katz's friend, Robert Mahoney. They wanted to imply that their product would be faster than ARC and other compression formats of the time. The earliest known version of .ZIP File Format Specification was first published as part of PKZIP 0.9 package under the file APPNOTE.TXT in 1989. By distributing the zip file format within APPNOTE.TXT, compatibility with the zip file format proliferated widely on the public Internet during the 1990s.. The .ZIP file format was released into the public domain in 1989. 6.3.5: (2018) Documented compression methods 16, 96 and 99, DOS timestamp epoch and precision, added extra fields for keys and decryption, as well as typos and clarifications. WinZip, starting with version 12.1, uses the extension .zipx for ZIP files that use compression methods newer than DEFLATE; specifically, methods BZip, LZMA, PPMd, Jpeg and Wavpack. The last 2 are applied to appropriate file types when "Best method" compression is selected. In April 2010, ISO/IEC JTC 1 initiated a ballot to determine whether a project should be initiated to create an ISO/IEC International Standard format compatible with ZIP. The proposed project, entitled Document Packaging, envisaged a ZIP-compatible 'minimal compressed archive format' suitable for use with a number of existing standards including OpenDocument, Office Open XML and EPUB. In 2015, ISO/IEC 21320-1 "Document Container File — Part 1: Core" was published which states that "Document container files are conforming Zip files". .ZIP files are archives that store multiple files. ZIP allows contained files to be compressed using many different methods, as well as simply storing a file without compressing it. Each file is stored separately, allowing different files in the same archive to be compressed using different methods. Because the files in a ZIP archive are compressed individually it is possible to extract them, or add new ones, without applying compression or decompression to the entire archive. This contrasts with the format of compressed tar files, for which such random-access processing is not easily possible. A directory is placed at the end of a ZIP file. This identifies what files are in the ZIP and identifies where in the ZIP that file is located. This allows ZIP readers to load the list of files without reading the entire ZIP archive. ZIP archives can also include extra data that is not related to the ZIP archive. This allows for a ZIP archive to be made into a self-extracting archive (application that decompresses its contained data), by prepending the program code to a ZIP archive and marking the file as executable. Storing the catalog at the end also makes possible hiding a zipped file by appending it to an innocuous file, such as a GIF image file. A ZIP file is correctly identified by the presence of an end of central directory record which is located at the end of the archive structure in order to allow the easy appending of new files. If the end of central directory record indicates a non-empty archive, the name of each file or directory within the archive should be specified in a central directory entry, along with other metadata about the entry, and an offset into the ZIP file, pointing to the actual entry data. This allows a file listing of the archive to be performed relatively quickly, as the entire archive does not have to be read to see the list of files. The entries within the ZIP file also include this information, for redundancy, in a local file header. Because ZIP files may be appended to, only files specified in the central directory at the end of the file are valid. Scanning a ZIP file for local file headers is invalid (except in the case of corrupted archives), as the central directory may declare that some files have been deleted and other files have been updated. For example, we may start with a ZIP file that contains files A, B and C. File B is then deleted and C updated. This may be achieved by just appending a new file C to the end of the original ZIP file and adding a new central directory that only lists file A and the new file C. When ZIP was first designed, transferring files by floppy disk was common, yet writing to disks was very time consuming. If you had a large zip file, possibly spanning multiple disks, and only needed to update a few files, rather than reading and re-writing all the files, it would be substantially faster to just read the old central directory, append the new files then append an updated central directory. Each entry stored in a ZIP archive is introduced by a local file header with information about the file such as the comment, file size and file name, followed by optional "extra" data fields, and then the possibly compressed, possibly encrypted file data. The "Extra" data fields are the key to the extensibility of the ZIP format. "Extra" fields are exploited to support the ZIP64 format, WinZip-compatible AES encryption, file attributes, and higher-resolution NTFS or Unix file timestamps. Other extensions are possible via the "Extra" field. ZIP tools are required by the specification to ignore Extra fields they do not recognize. The ZIP format uses specific 4-byte "signatures" to denote the various structures in the file. Each file entry is marked by a specific signature. The end of central directory record is indicated with its specific signature, and each entry in the central directory starts with the 4-byte central file header signature. There is no BOF or EOF marker in the ZIP specification. Conventionally the first thing in a ZIP file is a ZIP entry, which can be identified easily by its local file header signature. However, this is not necessarily the case, as this not required by the ZIP specification - most notably, a self-extracting archive will begin with an executable file header. Tools that correctly read ZIP archives must scan for the end of central directory record signature, and then, as appropriate, the other, indicated, central directory records. They must not scan for entries from the top of the ZIP file, because (as previously mentioned in this section) only the central directory specifies where a file chunk starts and that it has not been deleted. Scanning could lead to false positives, as the format does not forbid other data to be between chunks, nor file data streams from containing such signatures. However, tools that attempt to recover data from damaged ZIP archives will most likely scan the archive for local file header signatures; this is made more difficult by the fact that the compressed size of a file chunk may be stored after the file chunk, making sequential processing difficult. The .ZIP specification also supports spreading archives across multiple filesystem files. Originally intended for storage of large ZIP files across multiple floppy disks, this feature is now used for sending ZIP archives in parts over email, or over other transports or removable media. The FAT filesystem of DOS has a timestamp resolution of only two seconds; ZIP file records mimic this. As a result, the built-in timestamp resolution of files in a ZIP archive is only two seconds, though extra fields can be used to store more precise timestamps. The ZIP format has no notion of time zone, so timestamps are only meaningful if it is known what time zone they were created in. In September 2007, PKWARE released a revision of the ZIP specification providing for the storage of file names using UTF-8, finally adding Unicode compatibility to ZIP. This ordering allows a ZIP file to be created in one pass, but the central directory is also placed at the end of the file in order to facilitate easy removal of files from multiple-part (e.g. "multiple floppy-disk") archives, as previously discussed. ZIP supports a simple password-based symmetric encryption system, which is documented in the ZIP specification, and known to be seriously flawed. In particular, it is vulnerable to known-plaintext attacks, which are in some cases made worse by poor implementations of random-number generators. New features including new compression and encryption (e.g. AES) methods have been documented in the ZIP File Format Specification since version 5.2. A WinZip-developed AES-based standard is used also by 7-Zip and Xceed, but some vendors use other formats. PKWARE SecureZIP also supports RC2, RC4, DES, Triple DES encryption methods, Digital Certificate-based encryption and authentication (X.509), and archive header encryption. The original .ZIP format had a 4 GiB (232 bytes) limit on various things (uncompressed size of a file, compressed size of a file, and total size of the archive), as well as a limit of 65,535 (216) entries in a ZIP archive. In version 4.5 of the specification (which is not the same as v4.5 of any particular tool), PKWARE introduced the "ZIP64" format extensions to get around these limitations, increasing the limits to 16 EiB (264 bytes). In essence, it uses a "normal" central directory entry for a file, followed by an optional "zip64" directory entry, which has the larger fields. The File Explorer in Windows XP does not support ZIP64, but the Explorer in Windows Vista and later do. Likewise, some extension libraries support ZIP64, such as DotNetZip, QuaZIP and IO::Compress::Zip in Perl. Python's built-in zipfile supports it since 2.5 and defaults to it since 3.4. OpenJDK's built-in java.util.zip supports ZIP64 from version Java 7. Android Java API support ZIP64 since Android 6.0. Mac OS Sierra's Archive Utility notably does not support ZIP64, and can create corrupt archives when ZIP64 would be required. However, the ditto command shipped with Mac OS will unzip ZIP64 files.. More recent versions of Mac OS ship with the zip and unzip command line tools which do support Zip64: to verify run zip -v and look for "ZIP64_SUPPORT". The .ZIP file format allows for a comment containing up to 65,535 (216−1) bytes of data to occur at the end of the file after the central directory. 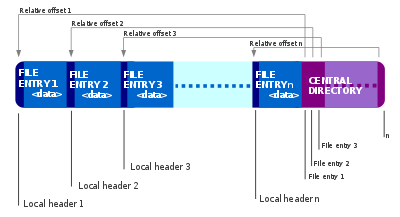 Also, because the central directory specifies the offset of each file in the archive with respect to the start, it is possible for the first file entry to start at an offset other than zero, although some tools, for example gzip, will not process archive files that do not start with a file entry at offset zero. This allows arbitrary data to occur in the file both before and after the ZIP archive data, and for the archive to still be read by a ZIP application. A side-effect of this is that it is possible to author a file that is both a working ZIP archive and another format, provided that the other format tolerates arbitrary data at its end, beginning, or middle. Self-extracting archives (SFX), of the form supported by WinZip, take advantage of this, in that they are executable (.exe) files that conform to the PKZIP AppNote.txt specification, and can be read by compliant zip tools or libraries. This property of the .ZIP format, and of the JAR format which is a variant of ZIP, can be exploited to hide rogue content (such as harmful Java classes) inside a seemingly harmless file, such as a GIF image uploaded to the web. This so-called GIFAR exploit has been demonstrated as an effective attack against web applications such as Facebook. The maximum size for both the archive file and the individual files inside it is 4,294,967,295 bytes (232−1 bytes, or 4 GiB minus 1 byte) for standard ZIP, and 18,446,744,073,709,551,615 bytes (264−1 bytes, or 16 EiB minus 1 byte) for ZIP64. .ZIP file format includes an extra field facility within file headers, which can be used to store extra data not defined by existing ZIP specifications, and which allow compliant archivers that do not recognize the fields to safely skip them. Header IDs 0–31 are reserved for use by PKWARE. The remaining IDs can be used by third-party vendors for proprietary usage. In another controversial move, PKWare applied for a patent on 16 July 2003 describing a method for combining ZIP and strong encryption to create a secure file. In the end, PKWARE and WinZip agreed to support each other's products. On 21 January 2004, PKWARE announced the support of WinZip-based AES compression format. In a later version of WinZip beta, it was able to support SES-based ZIP files. PKWARE eventually released version 5.2 of the .ZIP File Format Specification to the public, which documented SES. The Free Software project 7-Zip also supports AES in ZIP files (as does its POSIX port p7zip). When using AES encryption under WinZip, the compression method is always set to 99, with the actual compression method stored in an AES extra data field. In contrast, Strong Encryption Specification stores the compression method in the basic file header segment of Local Header and Central Directory, unless Central Directory Encryption is used to mask/encrypt metadata. There are numerous .ZIP tools available, and numerous .ZIP libraries for various programming environments; licenses used include proprietary and free software. WinZip, WinRAR, Info-ZIP, 7-Zip, PeaZip and B1 Free Archiver are well-known .ZIP tools, available on various platforms. Some of those tools have library or programmatic interfaces. The Info-ZIP implementations of the .ZIP format adds support for Unix filesystem features, such as user and group IDs, file permissions, and support for symbolic links. The Apache Ant implementation is aware of these to the extent that it can create files with predefined Unix permissions. The Info-ZIP implementations also know how to use the error correction capabilities built into the .ZIP compression format. Some programs do not, and will fail on a file that has errors. Versions of Microsoft Windows have included support for .ZIP compression in Explorer since the Microsoft Plus! pack was released for Windows 98. Microsoft calls this feature "Compressed Folders". Not all .ZIP features are supported by the Windows Compressed Folders capability. For example, Unicode entry encoding is not supported until Windows 7, while split and spanned archives are not readable or writable by the Compressed Folders feature, nor is AES Encryption supported. ^ "Phillip Katz, Computer Software Pioneer, 37". The New York Times'. 1 May 2000. Retrieved 14 June 2009. ^ Murray, Matt; Tannenbaum, Jeffrey A. (15 August 1997). "The Rise and Fall of a Software Star; Phil Katz Loved Code -- and Liquor". The Wall Street Journal (online ed.). Archived from the original on 20 October 2011. Updated 2000-06-19. ^ a b Stay, Michael. ""ZIP Attacks with Reduced Known Plaintext"" (PDF). Math.ucr.edu. Archived from the original (PDF) on 28 October 2017. Retrieved 9 September 2017. ^ "Additional Compression Methods Specification". WinZip. Mansfield, CT: WinZip Computing, S.L. 19 May 2009. Retrieved 24 May 2009. ^ "What is a Zipx File?". Winzip: Knowledgebase. Mansfield, CT: WinZip Computing, S.L. 13 August 2010. Retrieved 17 August 2010. ^ "ISO/IEC 21320-1:2015 Document Container File — Part 1: Core". ITTF. 2015. ^ a b c d e f "File : APPNOTE.TXT - .ZIP File Format Specification : Version: 6.3.4" (TXT). Pkware.com. Retrieved 9 September 2017. ^ Adler, Mark. "How are zlib, gzip and zip related? What do they have in common and how are they different?". Retrieved 27 November 2018. ^ "AES Encryption Information: Encryption Specification AE-1 and AE-2". Winzip.com. Retrieved 9 September 2017. ^ "APPNOTE - PKZIP/SecureZIP - PKWARE Support Site". Pkware.com. Retrieved 9 September 2017. ^ "File : APPNOTE.TXT - .ZIP File Format Specification : Version: 6.3.4" (TXT). Pkware.cachefly.net. Retrieved 9 September 2017. ^ "QuaZIP changes". 22 January 2014. Retrieved 25 January 2014. ^ "Python enhancement: Use allowZip64=True by default (3.4)". Retrieved 6 May 2014. ^ Shen, Xueming (17 April 2009). "ZIP64, The Format for > 4G Zipfile, Is Now Supported". Xueming Shen's Blog. Sun Microsystems. Retrieved 27 September 2010. ^ "Sign in - Google Accounts". code.google.com. Retrieved 9 September 2017. ^ "Error: invalid central directory file header signature when unzipping big files, zipped by mac os · Issue #69 · thejoshwolfe/yauzl". GitHub. ^ "Extract large zip file (50 GB) on Mac OS X". Retrieved 17 December 2018. ^ McMillan, Robert. "A photo that can steal your online credentials". Infoworld.com. Retrieved 9 September 2017. ^ "ZipArchive: Zip64 Format: Crossing the Limits of File Sizes and Number of Files and Segments". Artpol-software.com. Retrieved 9 September 2017. ^ "WinZip – AES Encryption Information". Winzip.com. Retrieved 9 September 2017. ^ "Software makers patch Zip tiff". News.com. Retrieved 9 September 2017. ^ John Leyden. "Zip file encryption compromise thrashed out". Theregister.co.uk. Retrieved 9 September 2017. ^ "Why is Windows Compressed Folders (Zip folders) support stuck at the turn of the century? ".